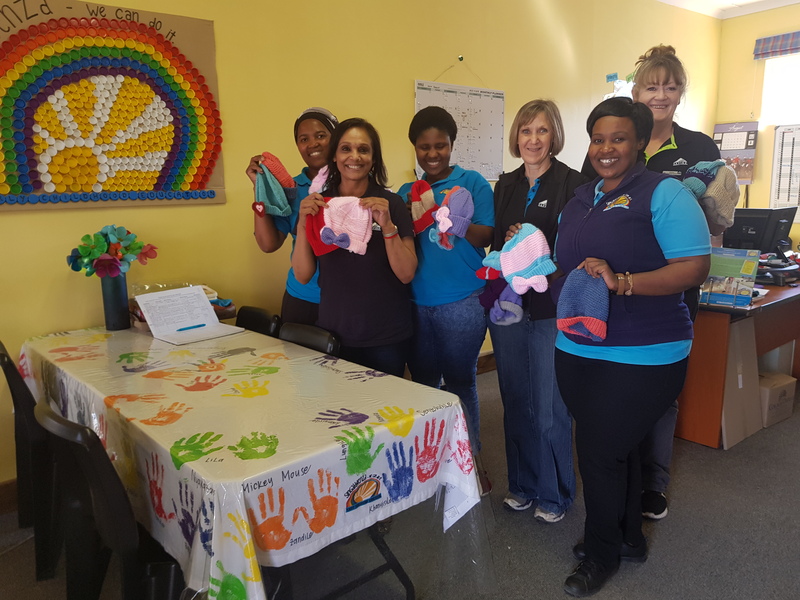 Nimble-fingered knitters at Safire Insurance have been creating snug, colourful beanies to keep warm the little ones at crèches where Singakwenza donates their educational toys made from waste products. Singakwenza, meaning “We can do it”, is a non-profit organisation building sustainable Early Childhood Education programmes in economically disadvantaged communities, using resources produced solely from recycling to help caregivers provide fun, educational activities so young children can learn through play. Ruth Bezuidenhout and Wendy James of Crop Division thought that knitting with a purpose would be a useful, entertaining way to pass a lunch break. Safire would provide the wool and knitting needles, and Safire staffers would voluntarily put in the effort while relaxing in the new staff room. Initially Ruth and Wendy knitted a few rows in a couple of different colours and then left them upstairs in a box with the challenge going out for others to knit a few more rows. For those who don’t know how to knit, the invitation was to ask another staff member to teach them – sharing skills while sharing the caring! The Safire knitters plan on building up a bountiful batch of beanies ready for next winter, although in the Midlands, cold days come even in summer!